There are good and not-so-good vegan pumpkin pies you can make for your green Thanksgiving feast. 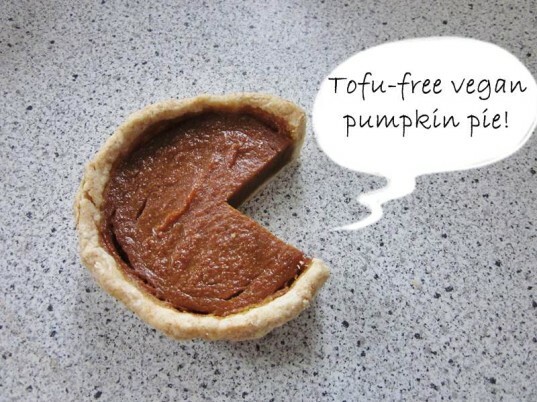 I've tried countless online recipes for vegan pumpkin pie and mostly I've learned the following. One, I HATE pies made with tofu, as the flavor seems diluted and the texture is odd. Two, it seems like lots of people post recipes online that they've never even tested because there's a ton of bad pie recipes out there. 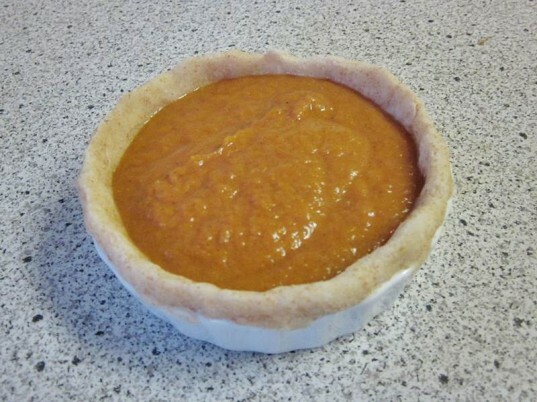 It took me a long time to find, adapt and settle on a good vegan pumpkin pie recipe. Currently, the recipe posted below is my favorite. It gets rave reviews from my family and friends and the texture is as close to pumpkin pie that's made with eggs as you can get. You may want to adjust the spices though. Some of my family loved this pie as-is, but a few members said, "I'd like more spice please" so play it by ear. Adjusting spices won't wreck your pie. 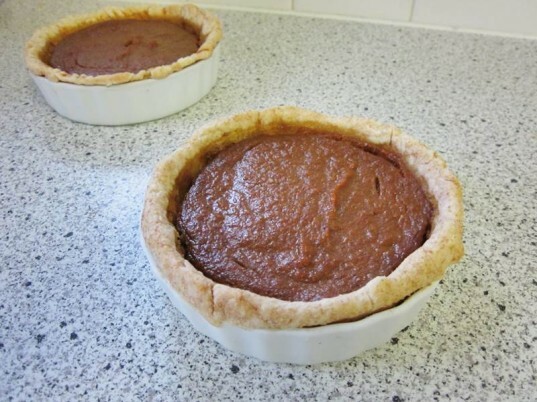 NOTE: The recipe below will make two thin vegan pumpkin pies or four thick mini 4 inch pies. Since the filling is rich, I like my pies thin. If you want fuller, thick pies that look more traditional, double the filling recipe below. 2 cups organic flour. I used whole wheat organic pastry flour. 2/3 cups vegan shortening – I use spectrum organic shortening, but you can use any veggie shortening you like. 4-8 tablespoons icy cold water. Combine all the pumpkin pie filling ingredients in a large bowl. Set bowl of filling aside in the fridge. The trick to the perfect pie crust, vegan or otherwise, is to touch the crust as little as possible as you make it. The more you mess with it, the more tough it’ll get. Barely breathe on or look at your crust! This is how you get flaky, delicious, super tender pie crust. This recipe makes 2 normal sized pie crusts or 4 mini pie crusts. Combine the salt and flour. Cut in the shortening with a pastry cutter just until it looks crumbled – like little pea-sized pieces. Grab a fork then drizzle water, two tablespoons at a time over the dry mixture. Use your fork to work the water into the dry mix, until it’s just damp throughout. Then STOP messing with it. Use your hands to gather the dough into two balls. It’s okay to press and push it a bit to get balls to form but seriously, do not knead this dough. Pour lots of flour onto your counter. Because you didn’t knead the dough, it’s going to be somewhat sticky. If you only sprinkle flour, your dough will stick to the counter, and you’ll have to form a new ball, which yes, is messing with your dough and remember what I said about that!? Roll out your dough into the size you need for your pie plate. Again, because your dough is soft, not kneaded, it may be hard to lift into your pie plate. Here’s a trick. Fold your dough carefully in half, then in half again. You’ll now be able to easily lift it, set it in your pie plate and unfold it. If you like, make your crust edges fancy. I’m not good at fancy, so I just pinch my edges a bit or use a fork to make crimped edges (I’m all about EASY). Distribute your filling into the pies, being careful not to get drops of filling on the top edges of the crust or it will burn in spots and taste funny. See the cracks in the image above and how the filling pulled away from the crust – that’s from over-baking! Bake your pies at 350 degrees for about 60 minutes. Now, the first time I made these pies, I left my pies in the oven too long – my oven cooks hot. If you do over-bake your pie, here’s what will happen – the filling will pull away from the crust as illustrated above or you’ll get unattractive cracks in the top of your pie. The best time to take your pies out of the oven is when the filling is mostly set but looks a wee bit jiggly. No worries, because after taking your pies out of the oven, you need to let them cool a bit, then pop your pies in the fridge for three hours or overnight. As your pies cool, they will finish setting up. 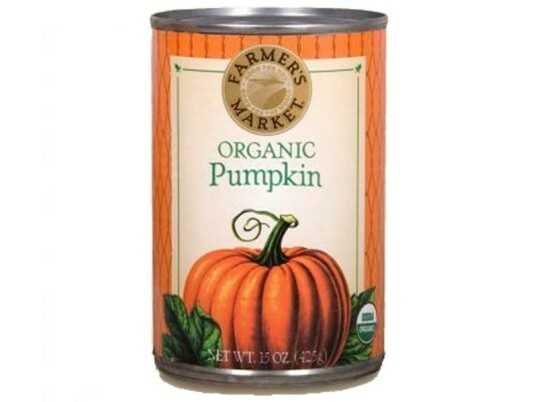 Combine 2 cups of organic pureed pumpkin, 1 cup alternative milk, 3/4 cup organic white sugar, 1/2 teaspoon salt, 3 tablespoons of cornstarch, 2 teaspoons cinnamon, 1/2 teaspoon ginger, 1/2 teaspoon cloves, 1 teaspoon nutmeg, 2 teaspoons organic Fair Trade vanilla extract and a tablespoon of flax meal in a bowl. Set aside. Make your crust, by combining 2 cups organic flour and 1 teaspoon salt. 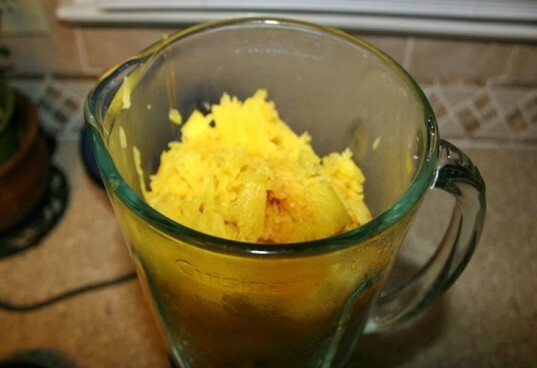 Cut in 2/3 cups vegan shortening. Drizzle icy cold water over your mix and work it in with a fork until it sticks together. 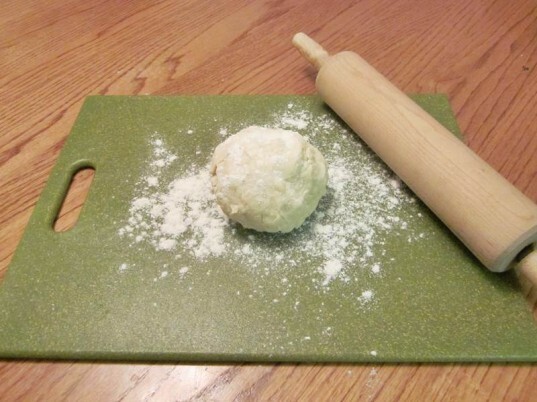 Pull your dough into balls, flatten and roll into circles. Place your crusts into pie plates, add your filling and bake at 350 degrees for 60 mins or less, watching to be sure the pies don’t burn. Remove pies from oven when filling is just set but still jiggly. Cool a little, then place in the fridge for at least 3 hours to set. 2 cups of organic pureed pumpkin - homemade or canned 1 cup alternative milk - I used organic vanilla soy milk 3/4 cup organic white sugar 1/2 teaspoon salt About 3 tablespoons of cornstarch - err on a little more is better side, i.e. use at least 2.5 tablespoons 2 teaspoons cinnamon 1/2 teaspoon ginger 1/2 teaspoon cloves 1 teaspoon nutmeg 2 teaspoons organic, Fair Trade vanilla extract Optional - tablespoon of flax meal (I add flax to almost everything, but you don't have to) For your crust: 2 cups organic flour. I used whole wheat organic pastry flour. 1 teaspoon salt. 2/3 cups vegan shortening - I use spectrum organic shortening, but you can use any veggie shortening you like. 4-8 tablespoons icy cold water. Combine all the pumpkin pie filling ingredients in a large bowl. Mix very well. Set bowl of filling aside in the fridge. The trick to the perfect pie crust, vegan or otherwise, is to touch the crust as little as possible as you make it. The more you mess with it, the more tough it'll get. Barely breathe on or look at your crust! This is how you get flaky, delicious, super tender pie crust. This recipe makes 2 normal sized pie crusts or 4 mini pie crusts. Combine the salt and flour. Cut in the shortening with a pastry cutter just until it looks crumbled - like little pea-sized pieces. Grab a fork then drizzle water, two tablespoons at a time over the dry mixture. Use your fork to work the water into the dry mix, until it's just damp throughout. Then STOP messing with it. DO NOT KNEAD! Use your hands to gather the dough into two balls. It's okay to press and push it a bit to get balls to form but seriously, do not knead this dough. Pour lots of flour onto your counter. Because you didn't knead the dough, it's going to be somewhat sticky. If you only sprinkle flour, your dough will stick to the counter, and you'll have to form a new ball, which yes, is messing with your dough and remember what I said about that!? Roll out your dough into the size you need for your pie plate. Again, because your dough is soft, not kneaded, it may be hard to lift into your pie plate. Here's a trick. Fold your dough carefully in half, then in half again. You'll now be able to easily lift it, set it in your pie plate and unfold it. If you like, make your crust edges fancy. I'm not good at fancy, so I just pinch my edges a bit or use a fork to make crimped edges (I'm all about EASY). Distribute your filling into the pies, being careful not to get drops of filling on the top edges of the crust or it will burn in spots and taste funny. Bake your pies at 350 degrees for about 60 minutes. Now, the first time I made these pies, I left my pies in the oven too long - my oven cooks hot. If you do over-bake your pie, here's what will happen - the filling will pull away from the crust as illustrated above or you'll get unattractive cracks in the top of your pie. The best time to take your pies out of the oven is when the filling is mostly set but looks a wee bit jiggly. No worries, because after taking your pies out of the oven, you need to let them cool a bit, then pop your pies in the fridge for three hours or overnight. As your pies cool, they will finish setting up.